The Alpinestars Supertech M10 is the result of years of development, testing and collaborations with the best motocross riders. 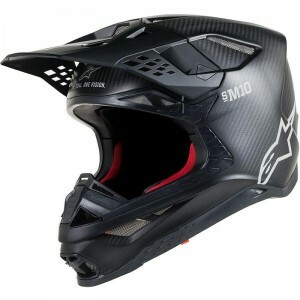 This carbon motocross helmet is made for competitive motocross riders who are looking for the best of the best. It achieves the highest levels in terms of both protection and performance. The Supertech M10 is full of advanced technical features. Protection has always been the priority during the development and production of this motocross helmet. This can also be seen in the large amount of protective features that can be found on this helmet. The most important parts are explained below. One of the most innovative features is the patented A-head fitment system. With this system the height and angle of the helmet can be adjusted. The A-Head system consists of a micro-adjustable cushion that is connected to the inner shell of the Alpinestars Supertech S-M10. It has 4 places were the position can be changed. By tightening all 4 setup positions, the fit can be made smaller. By adjusting only the rear or front two, the angle can be adjusted. The result is an ultra-specific setup, just as the rider wants it. 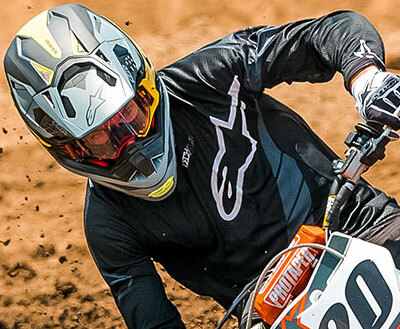 The bottom of the motocross helmet is raised to prevent contact with the collarbone as much as possible. This specially designed for riders who chose not to wear a neck brace. It is a good feature since collarbone fractures are relatively common in motocross racing. In addition to having a raised area, soft materials have also been applied. Should there still be contact between the collarbone and the motocross helmet, this impact will be damped. In order to preserve the strength of the chinbar, Alpinestars has applied a low weight radial ledge in the chinbar. Ventilation is an area where Alpinestars has set a new standard. 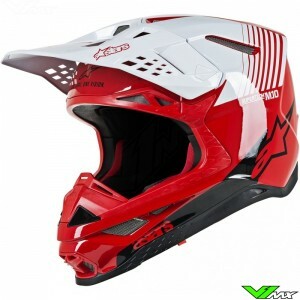 The entire motocross helmet is constructed to improve air flow. 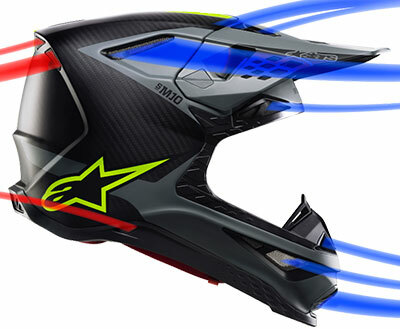 The Alpinestars Supertech M10 has a very aero dynamical design. Air flow that reaches the front of the helmet is led to the ventilation openings for additional air intake. Even the shape of the peak contributes to better ventilation. In total there are 19 inlet vents that supply fresh air to the rider. Inside the helmet, various channels ensure good flow and cooling where necessary. Hot and humid air is discharged through various large ventilation openings at the back and side of the S-M10. 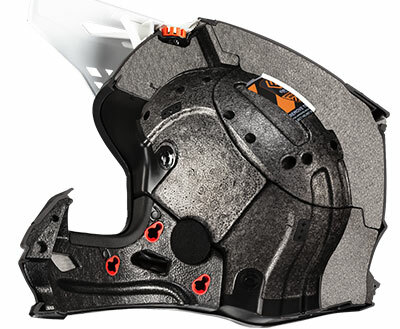 One of the protective features of the Supertech M10 is MIPS. This system is designed to reduce the risk of brain damage. As soon as an impact hits the helmet at an angle, a rotational movement can occur which can result in high stresses in the brain. This can cause a concussion or worse. To counter this problem, the MIPS system has been developed. It works through a slip layer with low friction that is incorporated in the inner lining. As soon as an impact occurs, the slip layer will begin to rotate. The rotation is then slowed down and damped, which reduces the peak stresses in the brain. The MIPS is placed between the inner lining and the A-head system. The S-M10 is equipped with a peak release system. As soon as you make a hard impact on the ground, the peak will go off the helmet. This reduces the chance of injury to the neck. An impact on a traditional helmet can cause large stresses on the neck which can be harmful. Alpinestars protects your spine with this release system. 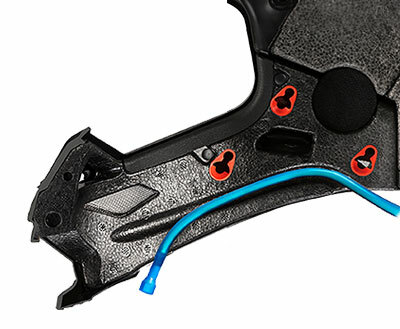 The unique design features click tabs that ensure a strong attachment, to prevent accidental releases of the peak. The helmet peak has a fixed position. To change the angle you have two choices. You can mount the extra supplied helmet peak, which has an increased angle. In addition, you can use the A-head system, which allows you to change the angle of the helmet. This is further explained under ‘A-Head Fitment system’. Hydration systems are a very important part of many enduro and motocross riders gear. It provides an easy hydration without costing you time. The Alpinestars Supertech M10 is therefore designed for the use of hydration systems. 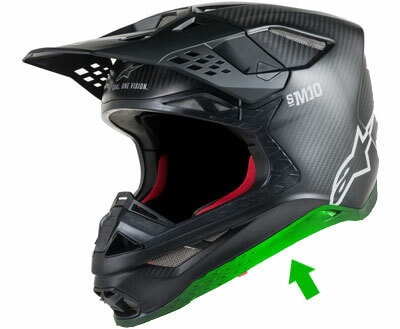 The drinking tube can be mounted in the cheek parts of the motocross helmet, as shown in the picture above. The canal for a the drinking tube is placed on both sides of the helmet. The S-M10 is also suitable for use with the EJECT system. This is an inflatable cushion that can be place at the top of the helmet. It allows you to safely remove the helmet after a crash. The EJECT and hydration system are not included. The Alpinestars Supertech S-M10 is equipped with Cool-max lining. This antibacterial material ensures long-lasting freshness and fast drying performance. The inner liner can be removed for easy washing. The design of the Supertech M10 is the result of performance and strength optimization. Yet the end product is a beautiful motocross helmet that fits perfectly with the style of Alpinestars. It has an aggressive appearance with modern and clean lines. In addition, the designers made beautiful graphic designs that fit perfectly with the rest of the Alpinestars motocross gear collection. Keep an eye on this page because new colors will be released soon. It is available in two price categories. The first one is called the ‘Solid’, this is a single color without a design which is priced lower. The second version are the painted helmets with designs, these are slightly more expensive. To keep the outer surface looking good for longer, Alpinestars has equipped it with a TPE coating. 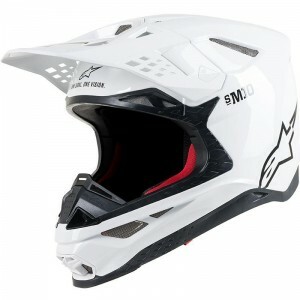 The S-M10 is designed to work with all modern motocross goggles. Large goggles such as the Oakley Airbrake and Scott Prospect also fit in the eyeport. 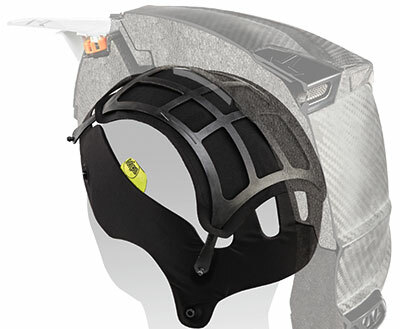 This multi-composite carbon motocross helmet is designed to spread impacts over a large area. This allows the EPS lining to absorb the impacts better and thus provide better protection to the rider. The EPS impact damping consists of 4 parts, each with a specific density. Weight is also an important feature for a motocross helmet, both for safety and riding performance. To ensure that the S-M10 has a low weight, there has been a lot of optimization, both in design and production. Alpinestars has achieved an excellent weight to strength ratio with optimum energy absorbing properties. The weight of only 1260 grams is ideal for any competitive motocross or enduro rider. The Alpinestars Supertech S-M10 has been tested at the Alpinestars Racing Development Center. The results show it is much safer than the current requirement for helmet regulations. For direct and linear impacts it scores 41% better, for rotation and angular impacts it is 48% better on average. 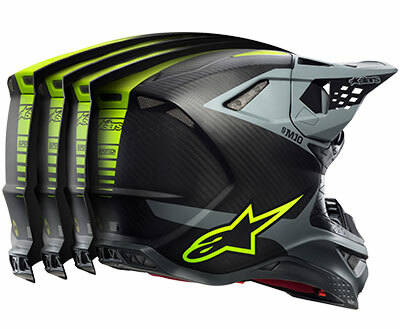 The Alpinestars Supertech M10 is constructed from a 3-layer composite shell. The outer layer is made of high density carbon and serves as a strong barrier that offers optimal energy distribution. Below is a layer of UD Carbon. The UD Carbon provides radial strength around the shell that prevents compression, but allows a controlled deflection for reducing transmitted impact energy. The bottom layer is made with aramid fibre, which offers optimal penetration protection. The 3 layers are connected with an epoxy resin that is optimized for strength and energy control. 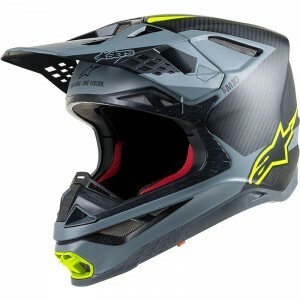 The result is an advanced motocross helmet with a very strong construction and low weight of only 1260 grams. The Supertech S-M10 shell is designed to offer the best fit. It is produced in no fewer than 4 shell sizes. This not only improves the comfort, but also the effectiveness of the motocross helmet in a collision. 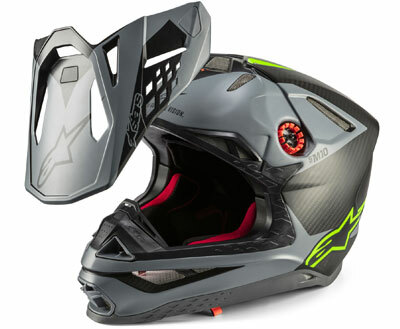 The Alpinestars S-M10 is also a good choice for riders with a motocross neck brace. It has a large and flat surface at the bottom, to make sure the helmet makes good contact with the top surface of the neck brace. The size table of the M10 helmet is shown below. You can easily measure the circumference of your head by using a measuring tape. Wrap it around your head, about 2cm above your eyebrows. Keep the measuring tape above your ears and measure the largest size. Is the size not to your liking? You can easily return or exchange it with the supplied return form. At V1mx, a 30-day reflection period is used, to make sure you have enough time to decide on your purchase. 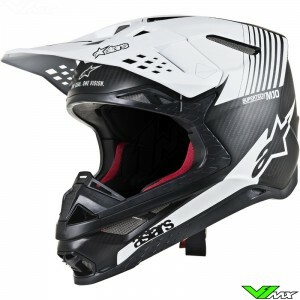 Do you want to order this Alpinestars motocross helmet, but still have a question about the product or about placing an order? Please contact the V1mx customer service. We would be happy to help you.